The subsections below outline the buffering model for this specification. It describes the various rules and behaviors associated with appending data to an individual source buffer. At the highest level, the web application simply creates source buffers and appends a sequence of initialization segments and media segments to update the buffer's state. The media element pulls media data out of the source buffers, plays it, and fires events just like it would if a normal URL was passed to the src attribute. The web application is expected to monitor media element events to determine when it needs to append more media segments. There are several ways that media segments can overlap segments in the source buffer. Behavior for the different overlap situations are described below. If more than one overlap applies, then the start overlap must be resolved first, followed by any complete overlaps, and finally the end overlap. If a segment contains multiple tracks then the overlap is resolved independently for each track. 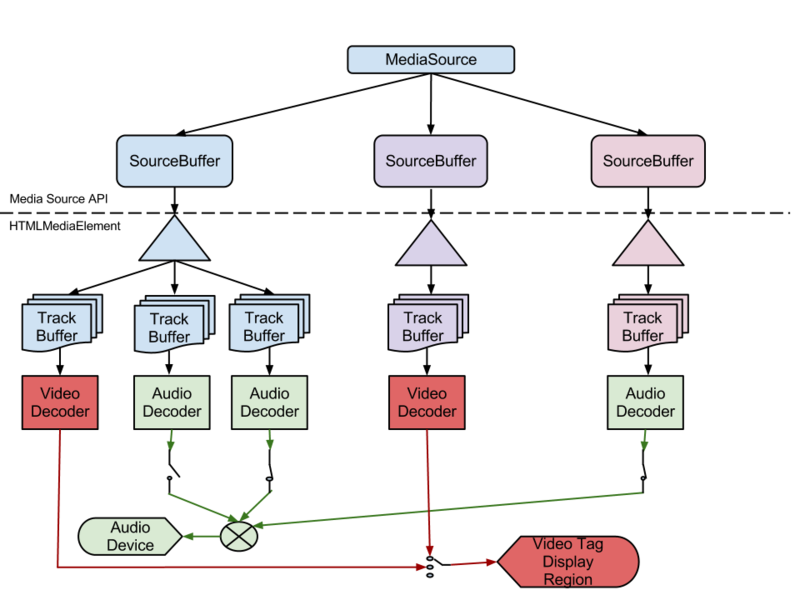 The figure above shows how the source buffer is updated when a new media segment completely overlaps a segment in the buffer. In this case, the new segment completely replaces the old segment. The figure above shows how the source buffer is updated when the beginning of a new media segment overlaps a segment in the buffer. In this case, the new segment replaces all the old media data in the overlapping region. Since media segments are constrained to starting with random access points, this provides a seamless transition between segments. The figure above shows how the source buffer is updated when the end of a new media segment overlaps the beginning of a segment in the buffer. In this case, the source buffer tries to keep as much of the old segment as possible. The amount saved depends on where the closest random access point, in the old segment, is to the end of the new segment. In the case of audio, if the gap is smaller than the size of an audio frame, then the source buffer should insert silence for this gap and not reflect it in buffered. The entire new segment must be added to the source buffer, but it is up to the implementation to determine how much of the old segment data is retained. The figure above shows how the source buffer is updated when the new media segment is in the middle of the old segment. This condition is handled by first resolving the start overlap and then resolving the end overlap.